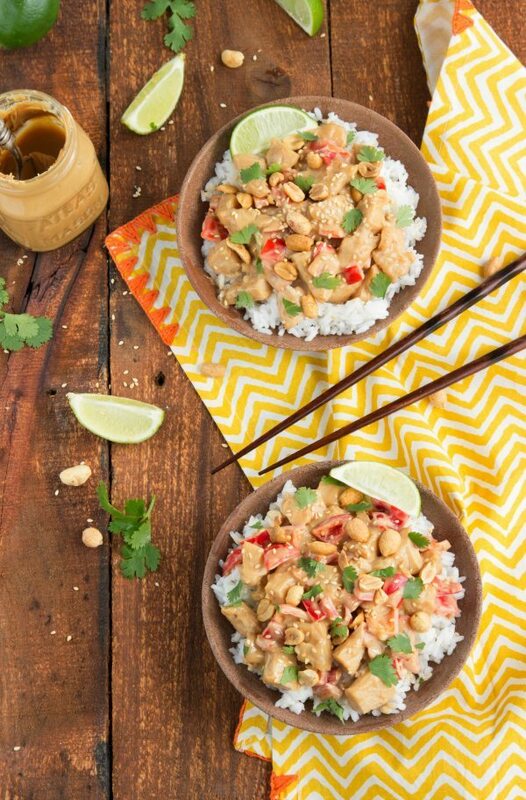 A simple, under 30 minute meal including chicken and red bell peppers tossed in a delicious peanut sauce over a bed of jasmine or white coconut rice and garnished with peanuts, cilantro, and sesame seeds. 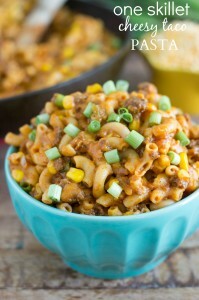 A meal the whole family will love! Here’s the thing – if it’s something I can make easily at home, it’s out. If it’s something that I’m not sure I will like, it’s out. I don’t like to be disappointed by an order so I usually go for the things I know I love. So the husband took me to Applebee’s a few weeks ago and contrary to my “rules” for ordering at a restaurant, I tried something completely new, I tried something I was unsure of, and I tried something that was (seemingly) easy to replicate. I ordered a Thai salad that had chicken tossed in a peanut sauce. I’m usually not the biggest Thai fan, I’d never tried this salad at Applebee’s, BUT I was most definitely not disappointed. The salad was awesome! Also, sometimes trying new things at a restaurant makes for a super exciting experience. Yes, a lot of my world revolves around food. Rinse the rice and combine the rice, coconut milk (reserve 3 tablespoons for peanut sauce), water, and salt if desired (1 teaspoon) to a large pot over medium-high heat. Occasionally stir the mixture. Once it begins to lightly boil, stop stirring, reduce the heat to low, and cover with the lid. Allow to simmer for 15-20 minutes or until the rice has absorbed all of the liquid. Meanwhile, cube the chicken into small pieces and combine the chicken with the oil in a large saucepan. Cook until the chicken is lightly browned. Remove the stems and seeds from the red bell peppers. Chop into small pieces. Once the chicken is mostly cooked through add in the peppers. Stir around the peppers and chicken until tender and the chicken is completely cooked through. In a blender or food processor, combine the peanut butter, coconut milk, soy sauce, minced garlic, minced ginger root, hot sauce (if desired), brown sugar, and lime juice. Blend or process and then slowly add hot water until your desired consistency is reached. Taste the sauce and adjust seasoning to preference (more garlic, soy sauce, sugar, or lime if desired). Pour the peanut sauce over the completely cooked chicken and mix well. Add to the rice. If desired, pull the cilantro leaves from the stem and add to the dish. Garnish with peanuts and sesame seeds if desired. The cook time refers to the chicken and red pepper mixture. The rice will take longer. I am SO the same! It takes me forever to order, and once I try something and like it, that is all that I will order from that restaurant forever! I’ve never made a peanut sauce. Certainly sounds yummy though. I’m sure my kids would gobble this up quick! Pinning for later. I’m the same way as you, Chelsea…I take forever to order at restaurants, too! And the thing about it is that I usually look at the menus online before we go out to eat. My husband always pokes playful fun at more for that! 🙂 I love this recipe! 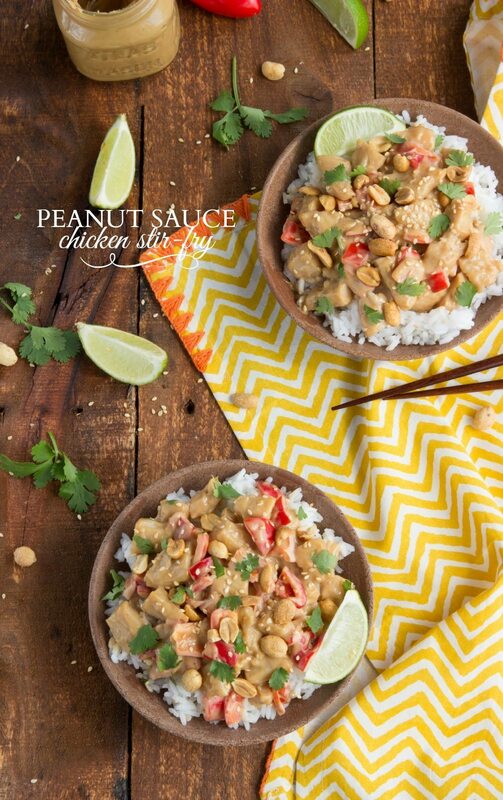 I’ve just been getting into making stir fries, so this peanut sauce sounds delicious! Pinned! This looks delicious! Definitely need to add this to our menu soon! I definitely have criteria when ordering at restaurants too! 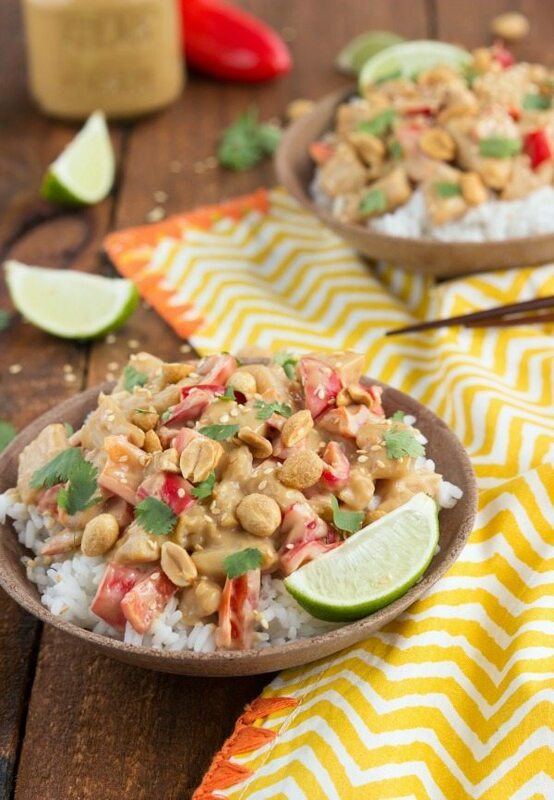 This peanut stir fry looks awesome…I love a good peanut sauce! This dish looks sooo good. I seriously LOVE peanut sauce! I would eat this meal for dinner any night of the week! And I hear you on taking forever to order – I’m the same way! I think it is b/c we are so obsessed with food! That’s so me! It takes years for me to choose and I always go for pretty much the same thing 😉 This stir fry looks incredible – peanut anything is my favorite! This looks awesome, Chelsea! I’m like you, I usually stick to the same things at restaurants. I’m not usually into thai food either, but this does look really good! I would totally try it. And probably love it. 🙂 Pinned! Girllll, we’re on the same page today! 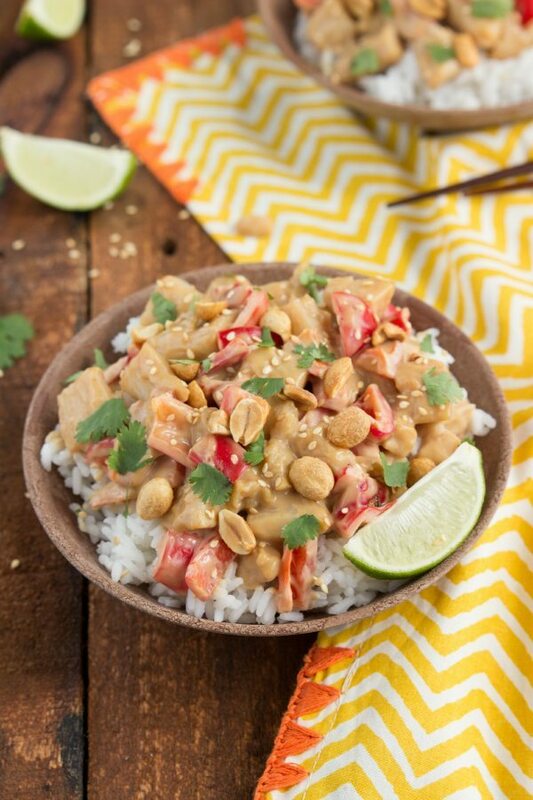 I have a peanut sauce dish as well, I don’t know about you but I’ve had SUCH trouble coming up with the perfect peanut sauce. I want to try yours! Oh, and that whole ordering thing? Right there with ya. I can never EVER make a decision (my husband does not get a kick out of it), and when I do it’s always something I don’t think I could make at home super easily. People like us are no fun to be with when we are disappointed by our food. This looks fantastic! I have a peanut noodle dish I’m quite fond of, but I should really try peanut rice dishes as well. I definitely agree with your restaurant ordering strategy – no use ordering things I can make easily or often at home! Okay the universe is telling me to make some serious stir fries. Everywhere I look, I keep seeing amazing post after amazing post about stir fry, and this peanut sauce chicken stir fry has me salivating all over the place. Jk. But not really. My husband is the same way at restaurants. And then 50% of the time he gives up and just orders a club sandwiches & fries! I looooove peanut sauce! And now I’m craving coconut rice! Peanut sauce sounds just amazing! So yummy! I need to be a little more adventurous at restaurants – I’ll challenge myself this weekend like you! Love love love all the peanut sauce in this stir fry. So good. This looks soooo much better than take-out! Sometimes it’s better to make it yourself at home! This looks fabulous! I just love making stirfry sauces from scratch – a million times better than the bottled stuff. I will have to try! haha I have a hard time ordering too. I don’t want to be disappointed but I also don’t want to order something that I make at home! It’s hard being a food blogger : ) So usually I get something I know is going to be good. I should try branching out sometime… This chicken stir-fry looks so good! I love making stir-fry at home! I just made this with green peppers, carrots, tofu, scallions, bamboo shoots. It’s soo delicious! Thanks for sharing this treat! This was so good! Next time I might double the recipe to have leftovers for lunch (my boyfriend eats 3 regular person servings in one sitting, so we didn’t have much leftover!). 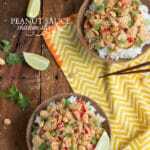 I adore peanut sauce and love how easy it is to make your own! I would probably put peanut sauce on anything and everything if I could. Was amazing!!! New favorite thank you!!!!! So, so glad to hear that!! Thank you Dayna!